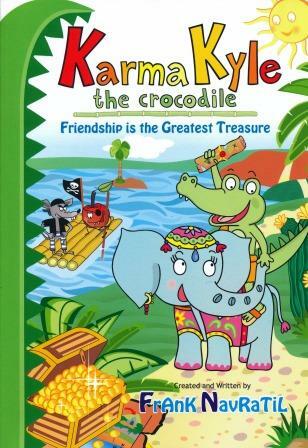 Karma Kyle is one curious and mischievous young crocodile. In this adventure from the Karma Kyle the Crocodile series, he once again lets his emotions get the best of him and finds himself in a tangled mess. A magical discovery of a treasure map inside a bottle at the bottom of the ocean, leads to an adventure to a lost island and a secret cave. Along the way he befriends a young elephant who has a special gift and who helps him find the treasure he so obsessively desires. Unknowing to them, two troublemakers, Bad Apple and Ripoff Rat, are following them with very bad intentions. Karma Kyle's friendship is put to the test and he is forced to make a serious choice. In the end he makes the right decision and learns what really matters most, while the troublemakers as always, get what they deserve. Written in rhyme and easy to read with beautiful captivating illustrations, author Frank Navratil presents another Karma Kyle adventure wit h a wonderful message for young children.